Do you have fun with food and make fun dinners for your family? We do….well at least at Halloween. It is just a fun time of year with so many great Halloween recipes and fun ways to play with your food. Today I'm sharing part of our family favorite dinner in October. 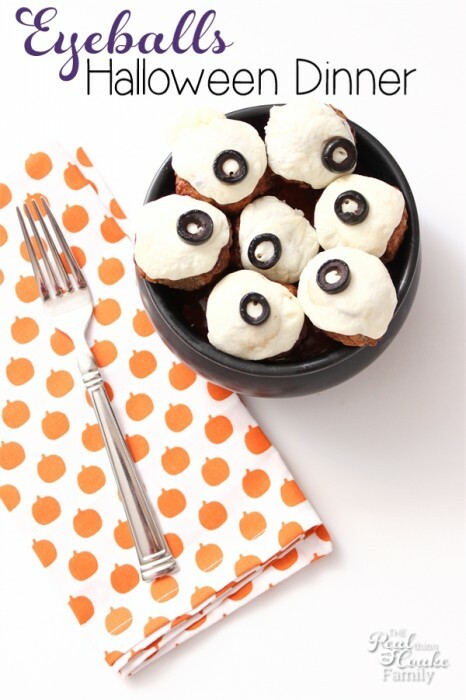 We love to eat eyeballs! 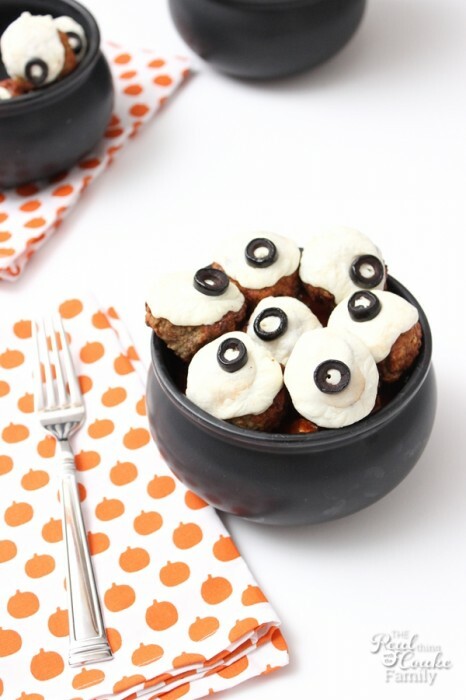 This year we get to eat eyeballs in cauldrons…..bwahahaha! Yep, I know I didn't fool you that I'm all evil. But it was fun to type out that evil laugh anyway. 😉 This is a super simple dinner that cooks up in minutes and everyone at my house loves. 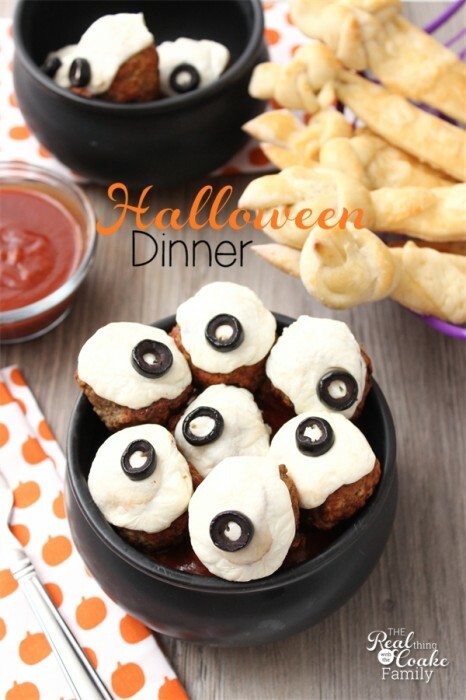 To eat eyeballs for dinner you will need three ingredient: Frozen meatballs, sliced black olives and ciliegine (small mozzarella cheese balls). 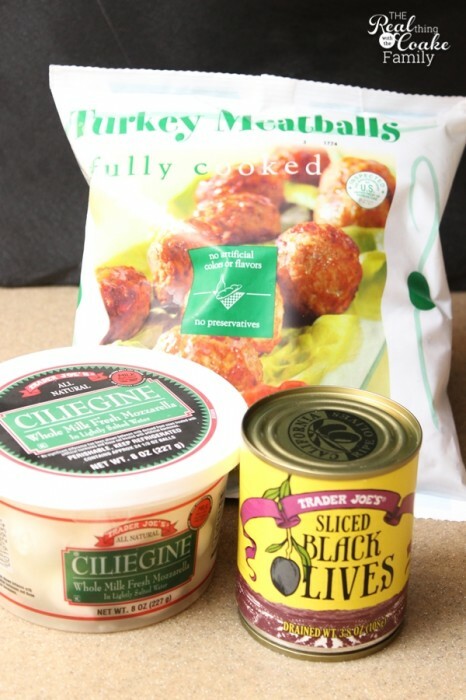 The ciliegine can be found in the deli section of your grocery store (or in the cheese case at Trader Joe's). 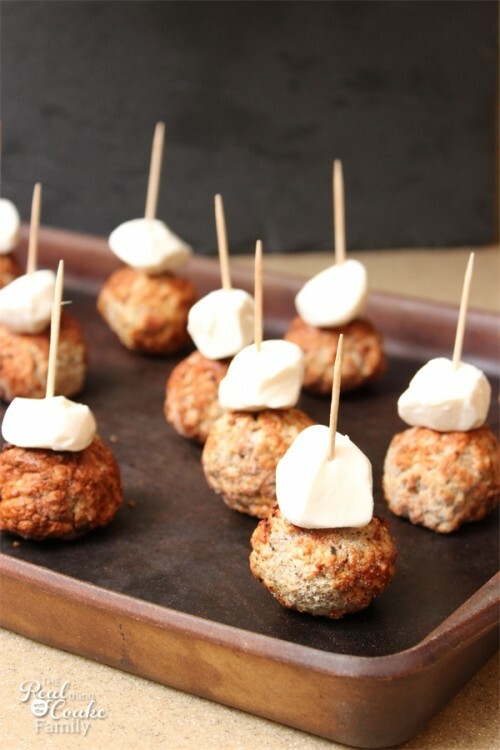 Cook your frozen meatballs according to the directions on the package, but before you place them in the oven, place one mozzarella cheese ball on top of each meatball. I use a toothpick to hold the cheese in place. Some cheese will melt better than others. If you don't like mozzarella or the cheese balls, you could use a slice of cheese on top as well. Any way you want to do it, you will want cheese on top that will melt down over the meatball while it cooks. This cheese was not the cheese pictured in the ingredients pic. I had meant to make this for you a couple of weeks ago, but life got the better of me and the cheese went bad before I got around to making it. I had to run to the grocery store near our house. The ciliegine that I bought didn't melt nearly as well as my usual Trader Joe's cheese, so they don't look quite as good as normal. About halfway through your cooking time, pull the meatballs out and place a black olive slice on the toothpick so it will cook slightly into the cheese. That is it! When the cook time is up, you are ready to eat. We often serve our eyeballs with some bones and some blood. The bones are bread sticks and I will have that recipe for you next week. The blood is pizza sauce for dipping the eyeballs and bones into. Creepy and totally delicious! You could also serve them in a bowl of tomato soup or another of my Halloween Recipes for Butternut Squash soup. What a fun idea and it looks easy enough! I’m pinning it and can’t wait to make some. Thanks so much! It is super easy and yummy. Perfect! These are great!!! Thanks for sharing on the What’s for Dinner link up!! What a cute dinner idea! Thanks for sharing with us at Throwback Thursday. Pinned and shared!